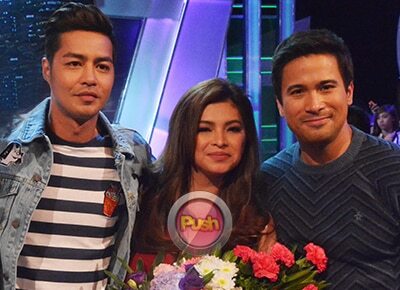 The stars of the Star Cinema movie, The Third Party namely Angel Locsin, Sam Milby, and Zanjoe Marudo surprised the teen housemates as they entered the Pinoy Big Brother house as doctors. The three conducted checkups on each of the housemates who just finished their military training. Among the selected housemates who underwent the “checkup,” it was Maymay Entrata who got star struck the most. The 19-year-old housemate proved that she is the ultimate fan girl when she freaked out upon seeing Zanjoe, Sam, and Angel. Meanwhile, Kisses Delavin opened up about her “heart situation” to the three doctors, admitting that she has a crush on fellow housemate Marco Gallo who likes someone else. Zanjoe then played the classic game, Flames to “predict” the future of Kisses and Marco. The result was “sweet hearts” and Zanjoe handed the paper to Kisses. They told her to keep it and to not let anyone see it, and to put it under her pillow. Later, the three celebrities met with the rest of the housemates who were in the living room. Zanjoe, a former celebrity housemate, said that he missed doing the dishes.